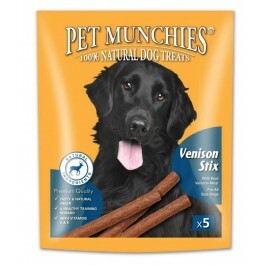 Pet Munchies Venison Stix are superior premium gourmet treats made with quality, human grade real meat. Delicious, Nutritious and Wholesome… all made with 100% Natural, human grade meat, just like nature made them, with natural textures, flavours and exceptional palatability dogs love. Perfect for use as a training reward. Succulent Venison Stix, made from the finest ingredients. With 100% natural quality real human grade meat, making a natural nutritious moist snack. A healthy training reward with Vitamins A & E. Free from artificial colours or flavours, low in salt, and easy to digest. From the moment the packet is open, the delicious aromas will set tails wagging, and the meaty taste will show your dog just how important he or she is to you. Baked in ovens, with the finest ingredients, with no artificial colours or flavours. Ingredients: Venison Liver 24.5% (max) venison 20% (max) Vegetable protein, Rice flour, Glycerin, Sugar, Starch, Sorbitol, Salt, Natural Colour (E172) Tea polyphenol, Vitamin E .
Typical Analysis: Crude Protein 22.00%, Crude Oils and Fats 12.00%, Crude Fibre 1.00%, Crude Ash 3.50%, Moisture 20.00%, Salt 0.29%.